It’s been an exciting few weeks for Norton! Last month Norton announced Norton One, Norton 360 version 6.0 and pre-announced Norton 360 Everywhere. Jatinder Shetra , one of our product experts, met UK media recently to share details about the new features that are in the updated version of N360 and what N360 Everywhere offers families who own multiple devices. 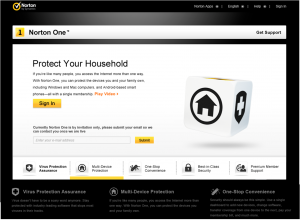 He also announced Norton One, a security-industry first, that allows consumers to buy and manage their security software through a cloud-based management console. To find out more about the products, we’ve asked Jatinder to summarise his week; What a great week! I loved speaking to the UK press about our new products, the new features in N360 and discussing the latest version of the product with members of the media. Not only has N360 adopted cool new features from NIS2012 but it has also received top performance scores from PassMark Software, making it a popular choice for easy-to-use protection and backup for important stuff. Discussing Norton One was also really interesting! The product is completely new to the industry, so listening to what journalists thought about the membership offering and their initial views of how it delivers a personalised experience, with dedicated support advisors, showed me a fresh prespective of how users outside Norton viewed the products. Personally, I see Norton One and its personalised service to the type of benefits that you receive from a credit card membership to one without membership features. It’s a new concept and I’m looking forward to the feedback that we receive from users that are taking part in the pilot. What do you think? Is Norton One something that you’ll be using?